If you want to experience a fantastic time in Branson, be sure not to miss the Who’s Bad Tribute Show at the Andy Williams Moon River Theater for one night only on July 8, 2018 at 8:00 pm. This tribute show in Branson is a high-energy production that pays homage to the King of Pop himself, Michael Jackson. Whether you are a fan of Michael Jackson watching his signature dance moves and listening to his funky tunes or simply wanting to enjoy a fantastic evening on the town, this show is for you. A Tribute to the King of Pop, Who’s Bad is the ultimate Michael Jackson experience. The fascinating charisma and energetic act of the performer is sure to impress everyone in the audience. As the world’s longest-running Michael Jackson tribute experience, the show has been entertaining many audiences from around the world for 14 years. Featuring an on-point band, the show truly brings MJ’s impressive catalog to life. The franchise has appeared in many cities the world over including London, Los Angeles, Porto Alegre, and more. This Tribute Show in Branson prides itself on encapsulating the essence of Michael Jackson’s original dance moves and music. As you watch this unforgettable MJ Tribute Show, you’ll hear some of MJ’s greatest hits such as ‘Billie Jean’, ‘Human Nature’, and ‘Beat It’. Who’s Bad Tribute to Michael Jackson is an unrivaled celebration of pop music’s one true King. The power-packed performance of Michael Jackson’s expansive catalog has ignited millions of crowds all over the world and can only be described as a jaw-dropping and must-see music show in Branson. The longest-running Michael Jackson tribute band and the only one to predate his untimely death, Who’s Bad has inspired even the critics, with sold out tickets on nearly 50 venues in the United Kingdom including London’s O2 in December 2010, the venue where Michael Jackson was slated to end his career with a 50-show “This Is It” concert series. Beyond the incomparable achievement in music, Who’s Bad has checked some of the world’s most famous venues with sold out tickets on their first tour of China with stops at Ningbo’s Grand Theatre and Hunan Grand Theatre in Chengsha. Who’s Bad has packed The House of Blues in Houston, Dallas, and New Orleans. They also rocked DC’s 930 Club and returned to their native Chapel Hill, NC boasting to an even more eagerly-awaiting audiences. They also performed sold-out shows in Colorado’s Bluebird Theatre and LA’s Gibson Amphitheatre and Romania’s Sala Palatalui to Teatro do Bourbon Country (Porto Alegre, Brazil). Who’s Bad has earned its name to Michael Jackson’s original groove and gravity-defying dance move, boasting over a team of dancers with resumes that include Broadway productions such as Phantom of the Opera. Whether you idolized the Jackson 5 or learned to moonwalk to Billie Jean, you will find Who's Bad is the ultimate music-and-dance driven Michael Jackson homage. 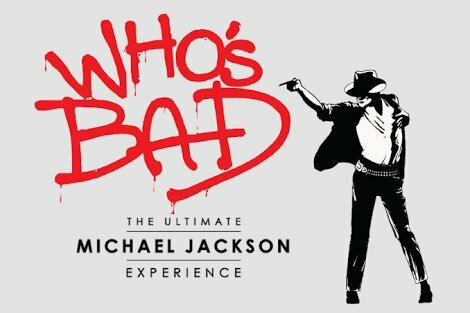 If you are a Michael Jackson fan, make sure to see the live performance of Who’s Bad Tribute Show in Branson.